In their seasonal migrations between warmer equatorial waters and the squid-rich Norwegian Sea, sperm whales generally don’t travel through the North Sea. Instead, they migrate along the western coast of the British Isles. The North Sea is far too shallow for the whales and their favourite squid prey (Gonatus fabricii) generally isn’t found there either. So once the whales entered the North Sea, it’s likely that they became disorientated, trapped in the shallow waters and ultimately beached. Necropsies performed on the whales suggested that they were healthy and well nourished, and so why they had entered the North Sea at all was a mystery. It is thought that some animals can get a sense of direction from the Earth’s magnetic field. Indeed, cetaceans, which includes whales and dolphins, are thought to be able to navigate using “magnetoreception” just like migrating birds and bats. The recent study suggests that the whales’ detour into the North Sea was the result of a geomagnetic storm interfering with the whales’ magnetic navigation system. The authors propose that these storms, which are the result of explosions of particles from the sun, created disturbances in the Earth’s magnetic field. They specifically identify two geomagnetic storms – occurring on December 20/21, 2015, and December 31 and January 1, 2015/2016 – which they argue could have caused disturbances strong enough to confuse the whales into travelling down the east coast of Shetland, rather than the west. The magnetic map of where the Norwegian and North Seas join. The whales should have travelled along the white arrow, but instead travelled along the red arrow. We have known for a long time that the sun’s activity, and the space weather it produces, can have a significant impact on us here on Earth. Not only does space weather produce the beautiful aurora that lights up the night sky, it can also cause serious damage to our technical systems. While there’s increasing evidence that space weather can also affect biological organisms, it’s important to remember that a correlation is not the same as proof. This entry was posted in In the News, Outreach on September 6, 2017 by NathanCase. Meet Steve, the bright purple band reflected in the lake. This entry was posted in In the News, Outreach on April 24, 2017 by NathanCase. Nathan is extensively quoted in a story by the Daily Express, discussing AuroraWatch UK. After solar winds arrive at our planet, Dr Case said: “The charged particles run into Earth’s atmosphere and collide with molecules. He said that oxygen emits the famous green colour and some red, while nitrogen gives off the blue and purply lights. This entry was posted in In the News on March 3, 2017 by NathanCase. The article “An analysis of magnetic reconnection events and their associated auroral enhancements” was recently accepted to the American Geophysical Union (AGU) Journal of Geophysical Research: Space Science. The article, for which Nathan was the lead author, describes how small scale processes in the earth’s magnetotail, called magnetic reconnection, is associated with enhancements of the aurora. 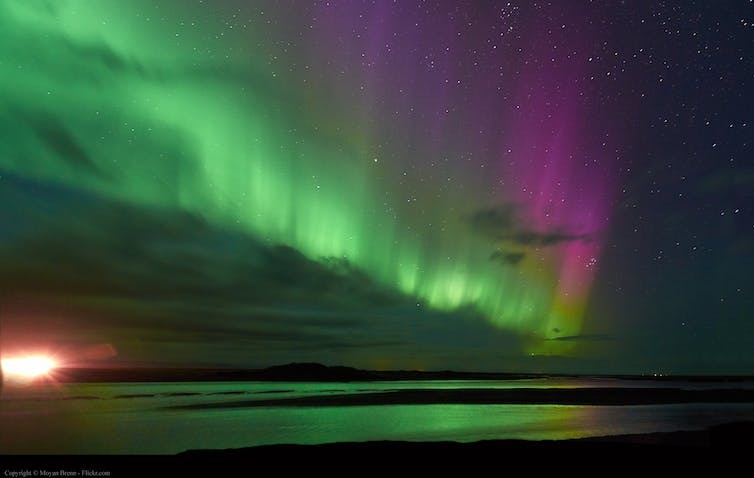 An analysis of simultaneous reconnection events in the near-Earth magnetotail and enhancements in the aurora is undertaken. Exploiting magnetospheric data from the Geotail, Cluster, and Double Star missions, along with auroral images from the IMAGE and Polar missions, the relationship between a reconnection signature and its auroral counterpart is explored. In this study of 59 suitable reconnection events, we find that 43 demonstrate a clear coincidence of reconnection and auroral enhancement. The magnetic local time (MLT) locations of these 43 reconnection events are generally located within ±1 h MLT of the associated auroral enhancement. A positive correlation coefficient of 0.8 between the two MLT locations is found. The enhancements are localized and short-lived (τ≤10 min) and are as likely to occur during the substorm process as in isolation of a substorm. No significant dependence of the reconnection or auroral enhancement location on the dusk-dawn components of the solar wind velocity (Vy), IMF (By) or local By or Vy, as measured by the reconnection-detecting spacecraft, is found. This entry was posted in Publications on March 3, 2017 by NathanCase. The number of sunspots observed on the sun. 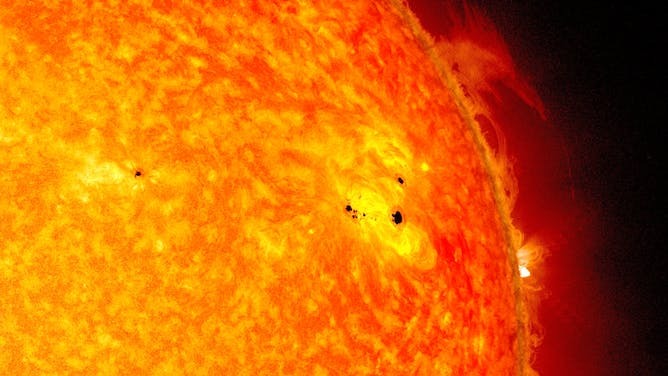 Sunspots (black) visible on the sun. 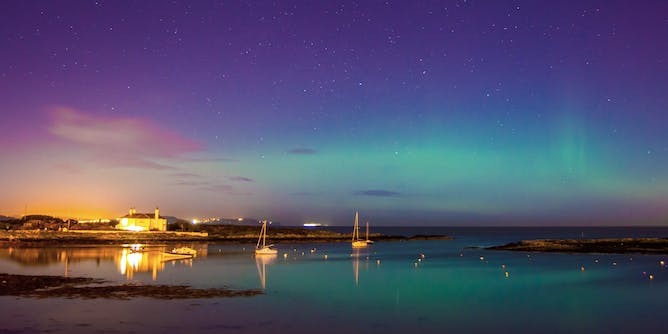 The aurora captured from Groomsport, Northern Ireland (UK). This entry was posted in In the News, Outreach on February 3, 2017 by NathanCase. The article “Determining the accuracy of crowdsourced tweet verification for auroral research” was recently accepted to the journal Citizen Science: Theory and Practice. The article, for which Nathan was the lead author, describes the accuracy of citizen scientists at determining whether tweets relating to “aurora” were in fact sightings of the natural phenomenon. This entry was posted in Publications on December 21, 2016 by NathanCase. Airglow spotted in panoramic shot of the Very Large Telescope. The aurora and airglow captured from the International Space Station. 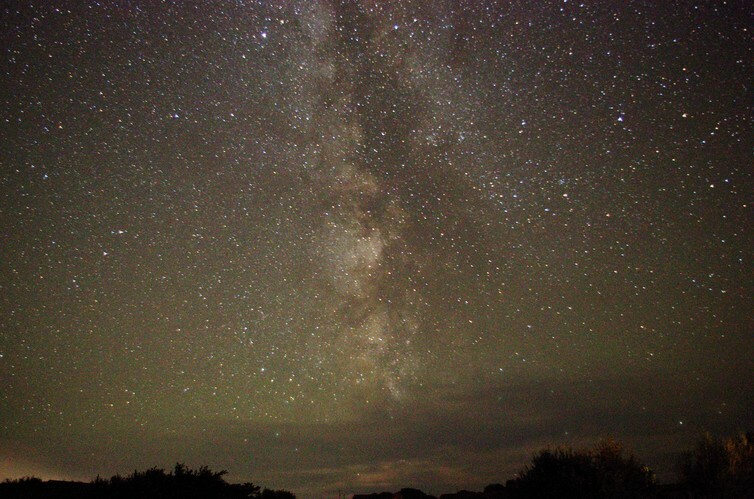 Airglow captured by Michael Darby from Cornwall, UK. The Milky Way shines through in the centre of the image. This entry was posted in In the News, Outreach on November 16, 2016 by NathanCase. 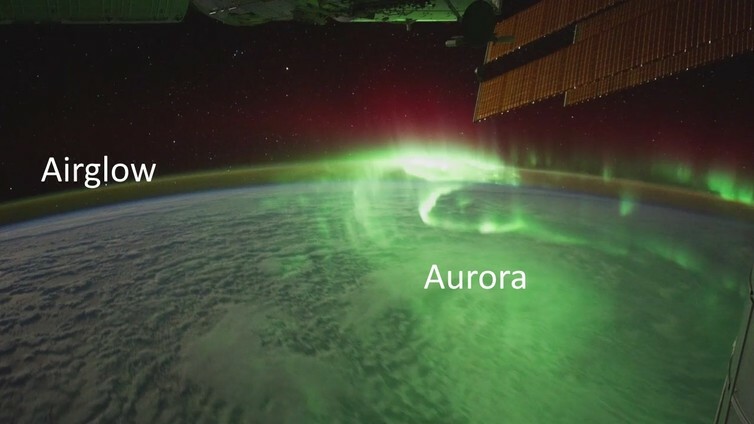 NASA has posted a feature article about how the Aurorasaurus project and a recent study by Nathan are helping scientists to understand the aurora and estimate where they might be visible from. This entry was posted in In the News, Publications on March 7, 2016 by NathanCase.